Shim sham to a swing band, tap your toes to dixieland or simply relax and sip a cocktail to some background jazz. We also have big bands, crooners, Postmodern and gypsy jazz bands for hire. Super smooth jazz and swing band fronted by a very talented male vocalist. Additional musicians, smaller line-ups and acoustic sets also available. Stylish and sophisticated jazz duo featuring smoky female vocals, a choice of piano or guitar accompaniment and songs from Billie Holiday, Norah Jones and Amy Winehouse. Extra musicians available with a choice of double bass, drums and trumpet. Jitterbug Jazz are a young, talented all-male piano trio dedicated to providing sophisticated musical entertainment for weddings, parties, corporate functions and any other special occasions. Quality Sinatra impersonator, perfectly capturing the spirit and sound of the late great Ol’ Blue Eyes. Ideal for retro and themed nights, and available as a soloist to backing tracks or with a full live band. Award winning sax player ideal for weddings, corporate events, private parties and club nights, either as a solo performer, adding a touch of class to the occasion or to freestyle alongside your DJ. What sort jazz band should I hire? For the perfect background music at daytime or early evening receptions, hire a small jazz band such as a duo or trio. 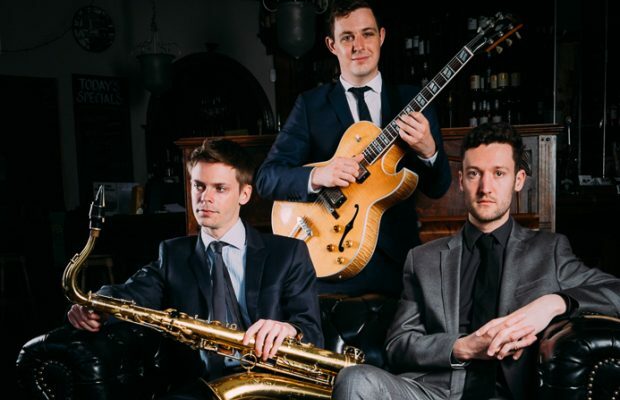 These are typically fronted by a vocalist or saxophonist and feature the glorious jazz standards of the Great American Songbook made famous by Frank Sinatra and Billie Holiday, as well as modern jazz artists such as Jamie Cullum and Michael Buble. When it’s time to get dancing, go for a larger swing band or big band including drums and fronted by the best crooners and starlets available. You’ll be treated to upbeat jazz dance music from the 1920s through to the late 1940s by artists such as Duke Ellington, Cab Calloway, Count Basie and Benny Goodman. A Great Gatsby style 20s band is a glamorous choice for a corporate event, high-end wedding or Prohibition era or mobster themed party. Other popular jazz sub-genres include: trad or dixieland jazz bands, ideal for outdoor events such as garden parties, gypsy jazz bands for a touch of 1930s Paris, and Postmodern Jukebox style bands – modern chart songs performed in a jazzy style. If you don’t have the budget or space for more than one musician, hire a jazz pianist or solo Rat Pack style singer, who’ll add a touch of elegance to any event. Booking a jazz or swing band? Our jazz and swing bands will bring all their own sound equipment, so you don’t have to worry about PA systems or sound engineers. Some of our big bands and swing jazz bands will bring lighting for the stage or dance-floor for after-dinner entertainment. You’ll be treated to up to two hours of jazz music, usually over two 1-hour sets or 3 x 40 minutes, but they can play for longer (for an additional cost) if preferred. For afternoon and early evening events, our bands aim to arrive about 90 minutes before the scheduled start of the performance, and smaller line-ups rarely need more than 30 minutes to set-up and sound-check. To keep your guests on the dancefloor into the night, larger bands can provide recorded jazz music between sets using their own sound system and mp3 player or iPod (or yours, if you prefer). If you’re booking a wedding jazz band for your evening entertainment, they might be able to provide music as a smaller line-up during the day. They could offer a solo cocktail piano set or jazz trio during your reception or meal. This saves you the extra expense of booking separate acts. If you’re planning a summer garden party, trad jazz bands and some gypsy jazz bands are the perfect choice, as they usually perform “unplugged” and will not require power. Most other jazz bands will need access to standard domestic plug sockets. As well as power, you’ll need to provide a flat, dry performance area large enough for the band. As a guide, allow approx 1.5m squared per musician. If the band is required to play outdoors, they will also need shelter from the rain and the sun. Most swing and jazz bands performing for after-dinner entertainment will require food and drink on the night. Some bands will also request things like reserved parking or a secure changing room, but this will be detailed in your booking contract. Most jazz bands can perform within the limits of most sound limiters with no problems. However if you’re booking a larger swing band (upwards of 4-piece) including drums and brass section, it’s worth checking noise restrictions at your venue. In many cases, levels can be reduced by asking the drummer to use brushes or “hot rods” instead of wooden sticks.